Aluminum magnesium legs has the characteristics of durable,skin-friendly and lightweight,they also comfortable for wear. UV400 protection lens block 100% of UVB and UVA rays.UV400 rated sunglasses is essential to protecting your eyes against long term UV damage and keeping your eyes healthy when you are outdoor. AL-MG ALLOY SUNGLASSES:Aluminum magnesium material makes frame strong and light.You can hardly feel them on your face.they also unbreakable and wear-resistant. POLARIZED LENS:Polarized sunglasses reduce glare reflected off of roads, bodies of water, snow and other horizontal surfaces.Restore true color and protect your eyes perfectly. UV400 PROTECTION:UV400 protection lens can blocks 100% harmful UVA & UVB Rays.The best way to protect your eyes is by wearing UV sunglasses whenever you’re outside. 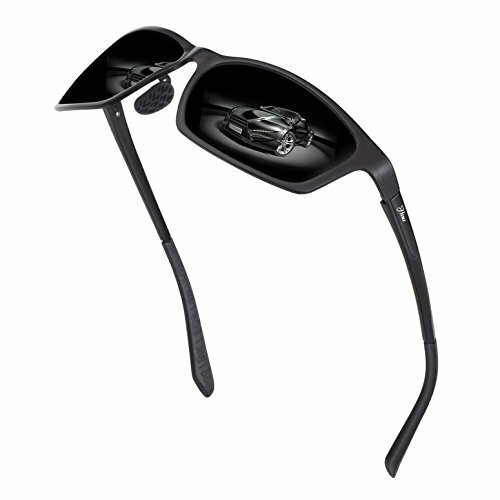 SUITABLE FOR :These sports style design sunglasses are the best choise for outdoor activities such as cycling,driving,bicycle,running,Fishing,racing,motorcycle,climbing and golf etc. HIGH QUALITY:Aluminum magnesium material frame are durable,safty and skin-friendly.soft rubber nose pad comfortable to wear and non-slip.make glasses more comfortable to wear.